Like anyone else, I find Steve Job’s product launch presentations to be mesmerizing. Apple is certainly getting their mileage out of his typically irresistable keynote performance from Macworld, where Jobs announced the iPhone – marketing the download from the homepage of the iTunes store and probably getting millions of downloads already. 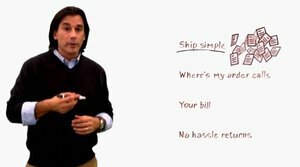 Yesterday evening, I also saw another TV spot for the new UPS Whiteboard campaign – dedicated to simplifying the process of international shipping and how UPS can help your business. Nintendo has also gotten into the simplicity game with their new Wii – using a combination of their website and branded consumer experiences in retail locations to help spread the word about the game console. Philips has received a lot of credit for restructuring their entire product development teams around the core tenets of simplicity and making this a core part of their corporate culture. There is a trend in all this, but it’s not about the necessity of making products simpler. There are plenty of products that we use on a daily basis that are not simple. The QWERTY keyboard is the classic example, having been laid out to actually slow down fast typing by separating the most commonly used letters – but since then we have learned to use it and adapted to it. Many top selling consumer electronics gadgets further prove this rule. The point is, people adapt to non-intuitive interfaces, especially when they have no other options. The real lesson is about simplicity in marketing. Using simplicity to sell is now an imperative, and one that can actually cut through the clutter. No one adapts to marketing that isn’t simple … it just gets ignored. Simple stories, on the other hand, are easy to understand and pass along. They are the essence of a message without the ego of the creative. They are concepts that respect their audience by not wasting their time. As an example, just compare the UPS effort to an ad that aired right after it during the NFL playoffs last night, the Rock ‘Em Sock ‘Em Robot ad for Dodge Ram – where two robots are boxing and then the winner goes on to attack a Dodge Ram and loses. What’s the simple message there – that if my car is ever attacked by boxing robots, I should buy a Dodge Ram? Aside for standing out for it’s lack of relevance, that ad doesn’t make the simplicity connection. It has no insight. When Steve Jobs tells the story of an interface, it makes sense. When he goes "boom" – it’s the most natural thing in the world to hear. UPS simplifies what many business owners believe is an extremely complex task – international shipping. Nintendo is the anti-game console for an audience that won’t go out and buy the latest Alienware desktop system with supercomputer processing power just for gaming. Sure, product simplicity and innovation is part of the message. But more and more, the most successful marketing campaigns are those that focus on telling a story simply and clearly. Now there’s an idea: cutting through the clutter without needing to raise your voice or blindly throw more dollars at advertising creative. Sounds too simple.